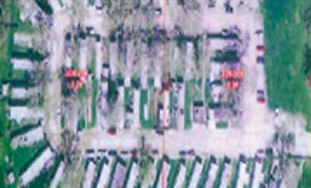 This property is a 57 unit mobile home park located in Indiana. The trailers are your typical single wide units with numerous residents living in the park for many years. Many of the trailers are of older vintage. The condition of the park was in total disrepair. Many of the trailers were abandoned and had been vandalized for their metal. The utility company had shut the water off for nearly a week due to nonpayment of the utility bill. In addition, five trailers had no electric service for weeks due to a telephone pole falling on a service meter panel and cutting service off. Many of the tenants were not paying because of necessary repair work being neglected and because of the failure by the borrower to follow up with the tenants. Make immediate improvements which included having the water utility turned back on, clean up the site of trash, remove the abandon and damaged trailers, and strengthen the rent roll through the new tenants and enforcement of rent payment. In turn, this would improve the net operating income and stabilize vacancies. Due to the safety and health issues, an emergency appointment was made to appoint ALPS Group® Property Management as receivers. Immediately, ALPS Group® contacted the utility company and negotiated to have the water turned back on. A recommendation was made by ALPS Group® to have the abandoned trailers removed from the site. State law requires notice of the abandoned trailers and a sale conducted if no one claims the units. This was performed and the remaining trailers were scheduled for removal from the mobile home park. All existing tenants were advised of any back rent that was due and new leases were sent to each tenant. Many of the tenants appreciated having stability back in the community and improved asset positioning was accomplished. To receive emails about our latest updates, news, and events. Fill out the form below.